Byrdy Galernik dribbles. The sophomore guard played 10 minutes off the bench against Santa Clara. On a holiday for many people, Lydia Rohde played 39 minutes of competitive basketball. Jordan Hamilton tallied 36. Lindsey Pulliam and Abi Scheid logged 34 apiece. They better enjoy their Thanksgiving day off. Northwestern (4-0) survived its first hurdle of a taxing week with a 57-47 win over Santa Clara (1-3) on Wednesday, a stretch that gets far more difficult with three games in three days beginning Friday in Nashville. The hefty load of games will present challenges for a Wildcats team that has been heavily reliant on its starters. Rohde, Hamilton, Pulliam and Scheid all have averaged more than 31 minutes per game through NU’s first four contests, and the starting five has contributed a huge majority of the team’s points and rebounds. The lack of depth is particularly acute in the backcourt, where the surprise departure of junior guard Amber Jamison at the start of the season left NU with only four healthy scholarship players to fill the three guard positions. But Pulliam said the Cats don’t mind. Foul trouble could further hamper NU, a reality it dealt with in spurts on Wednesday. Junior forward Pallas Kunaiyi-Akpanah, who tallied 27 points and 21 rebounds a week ago against Oakland, picked up three early fouls before the break against the Broncos. 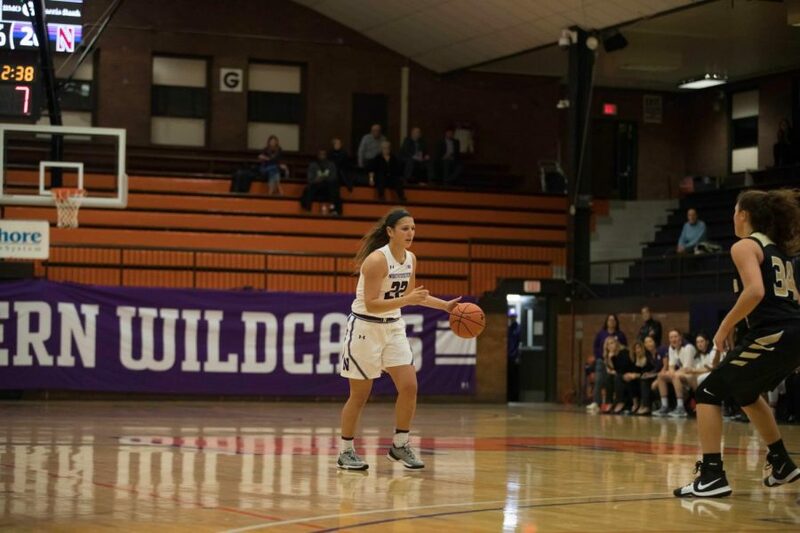 She played seven minutes in the first half, forcing the Cats to pull several reserves off the bench and rely on other players like Pulliam to shoulder the scoring load. McKeown used a handful of unusual lineup combinations, such as sophomore forward Bryana Hopkins at the 3 position and sophomore guard Byrdy Galernik at both guard spots. Beyond depth concerns, the Cats will face another challenge this weekend: the competition. NU will face two major-conference opponents in Tennessee, a sharp contrast from the four mid- and low-majors with whom the Cats opened the year. The Cats have yet to play a team that made a postseason appearance last season. In Nashville, NU will meet two NCAA Tournament qualifiers, Chattanooga and Auburn. That will pose a test for a young Cats team that starts three underclassmen. And with his floor general, Hamilton, likely to play extended and taxing minutes against the tough competition, McKeown came up with a holiday-themed gift for the freshman.